LED video walls or LED Walls are flat panel displays which use an array of light-emitting diodes as pixels for a video display. Their brightness enables them to be used outdoors where they are visible in the sun store signs and billboards, and in recent years they have also become commonly used in destination signs on public transport vehicles. LED displays are capable of providing general illumination in addition to visual display, as when used for stage lighting or other decorative (as opposed to informational) purpose. One of the many applications of LED displays is in video walls. A video wall is a unique configuration consisting of multiple displays tiled together contiguously or overlapped in order to form one large screen. Typically, video walls are developed with LCD (Liquid Crystal Display) panels, LED modules, or other technologies such as Laser DLP, or rear projection tiles. Each LED or “light-emitting diode” acts as a miniature bulb that emits colour when electrically engaged. Rather than back lighting the images, nowadays, LEDs are actually producing them. In the case of video walls, the screens must be specifically designed for that purpose, and have narrow bezels in order to minimize the gap between dynamic display areas. As well they must be bright, clear, and built with long-term serviceability in mind. Among the many reasons for using a video wall instead of a single large screen are to cover a larger screen area, to have more pixels and therefore higher resolution, or to make it of various shapes and sizes. 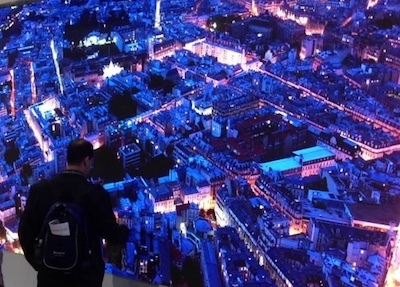 Currently, as the cost of high-resolution, high-brightness LED panels has decreased considerably, more and more video walls are built using small pixel pitch (or dot pitch) LED panels that can be as small as 0.9mm. In the simplest form, pixel pitch is the size of each LED cluster that conforms a single pixel, or the distance from the center of one LED pixel to the center of the pixel measured in millimetres. LED panels are very bright, which is the main reason why LED panels are used in most outdoor digital signage and also as a backlit in the most advanced LCD panels. LED brightness is measured in NITS, which indicates how much light the screen sends to your eyes within a give area. Technically speaking, a NIT is an amount of light output equal to one candela per square meter (cd/m2 – a standardized measurement of luminous intensity). To better understand the concept, let’s look at some examples: A typical TV has the capability to output around 100 to 200 Nits, while outdoor LED panels have the ability to output of 400 to 2,000 nits. The cost of a LED wall highly depends in the number of LED cluster in a given area, therefore to minimize cost of your next LED installation, the real problem is finding out what is the right pixel pitch for your venue. Pixel pitch typically ranges from around 0.9mm up to 20mm for indoor LED video walls and between 10mm to 34mm or higher for outdoor displays. The pixel pitch that you shall select for your LED video wall or LED digital display depends on the viewing distance. As mentioned, the smaller the pixel pitch number, the more pixels that will make up the image on your display and therefore, the more expensive will it become. For that reason, when designing your LED wall, first check what will be the distance to the typical viewer. Just remember that the cost of a 1mm pixel pitch will be significantly more expensive than a 10mm pixel pitch, and viewers from a certain distance will be unable to see any difference between them. So, wouldn’t be a smaller pixel pitch be better all of the time? Having a smaller pixel pitch does help your picture, but at a cost. By having a smaller pixel pitch, you increase the amount of LED clusters for your display. Since, for example, a 114″ display with a 4mm pixel pitch use 247,760 pixels, whereas a 6mm LED display of the same size uses only 96,000, the 4mm will cost much more than the 6mm type. That said, you can take your costs and still have a fantastic display by going with a larger pixel pitch if your audience isn’t too close to your screen. Video walls can be in the control room of venues related to telecommunications, emergency operations, utilities management, process control and transportation, as well as in hospitals, universities, museums, stadiums, and other large public venues. Some LED video walls are non-interactive, while many respond to touch, body motion and/or gestures. Companies such as Lusens and others have installed LED video walls at various venues to serve as immersive children’s spaces, donor walls, hall of fame walls, fan appreciation walls, real estate demo rooms, and others. You can see some of these on this Fan Appreciation Wall at the Oklahoma City Thunder’s Arena, this Donor Recognition Wall at Humber College or this Alumni Recognition Wall at Indiana University.